​If you are interested in applying, please continue reading all of the material below and clicking the link at the end. If you have questions, please do not hesitate to contact us at directors@campchickagami.org. Serving as a Camp Chickagami Summer Staff member is very fun and very hard. It involves early mornings and late nights, hot days and loud groups, being a leader and being a friend. It is all about teamwork and living as a model of sacramental ministry, where outward and visible actions are a sign of an inward and spiritual grace. ​If all the above characteristics of working on Summer Staff were thrown into a pot and stirred for long enough, the result would look a lot like servant leadership–the Summer staff serves campers and families, each other, and the Kingdom of God with grace, patience, and love. Every staff member is invited and expected to participate fully in the life of the community. This includes program, worship, and afternoon and evening activities. Whatever the job ALL STAFF POSITIONS are valued and important parts of the team. The norm is fulfilling one’s specific role…and then some. The whole staff works together attending to the many details that make summer camp happen in the context of Christian community. Counselors are: Primary caregivers for campers. Counselors are responsible for all aspects of the camp program, comprised of cabin life, supporting the Christian formation program, and recreational activities. This includes planning, facilitating, coordinating, and cleaning up from activities throughout the camp session, guiding campers in their personal growth, faith life and daily living skills. Intern staff are: Intentionally learning about all aspects of camp life; they are open-minded, ready for feedback and willing to be humbled by the job. Interns are supporting the leadership staff in living out the mission and ministry of camp. Program Interns are experienced staff members interested in learning about more of the behind the scenes aspects of summer camp programming. Program interns support and work alongside Christian Formation teams, the Program Director and counseling staff. All things program (and beyond) are supported by the program interns. Program Interns are weekly roles (assigned a week at a time, multiple weeks optional depending on interest and staffing). The Facilities Intern will work with the Executive Director and the facilities team on the board of advisors to support all aspects of facilities at Camp Chickagami. Self motivated and enthusiastic individuals are encouraged to apply. Interested in being a camp director when you grow up? This might be the job for you. Employment dates from the end of May through Mid-August (end date is negotiable). Room, board, food, vacation days and a stipend are provided. Participation in pre-season staff training date is required. It is suggested that volunteers also attend this meeting but is a requirement for all paid staff. The date for this training will be announced at a later date. Attendance is mandatory for onsite staff training June 23 – June 29. Due to Fourth of July Holiday, staff will not be required to be on site at camp Saturday, June 29 (after dismissal) and will be required to report back by 12pm on Saturday, July 6. 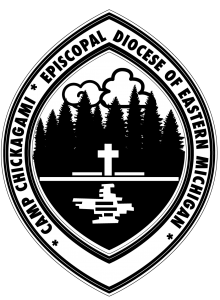 Certain summer staff have earlier report dates and expectations to attend at least one Work Weekend (either Memorial Day or Fall Closing) and Diocesan Convention as a camp representative. All summer staff must complete certifications in CPR and First Aid PRIOR to or during staff training. A list of training dates & locations will be made available to those hired upon request. The Water Front Director must hold a lifeguard certification, WSI and Red Cross Professional Rescuer PRIOR to June staff training. Lifeguards must hold a lifeguard certification, first aid and CPR PRIOR to June staff training. The Kitchen Supervisor must hold certification in ServSafe PRIOR to June staff training. A list of training dates & locations will be made available to those hired. A program entitled “Safeguarding God’s Children” – a sexual misconduct prevention training – will be conducted during staff training. An on-line course is required of all hired staff, to be completed prior to training. There will be basic on-line staff training sessions prior to staff physical report dates. On-line training is a requirement. It is expected that all Summer Staff will agree to a 48 hour pre-camp communication guideline once hired. By committing to being on Summer Staff at Camp Chickagami, you are agreeing to responding to an email received by you from a director of Camp Chickagami within 48 hours. If, for whatever reason, you are unable to respond to an email from camp staff within 48 hours, you are required to let your supervising director know prior to that time period. Background checks will be conducted on all hired staff. Drug testing may be conducted at the discretion of camp leadership. Paid Staff: Click here to apply! Paid staff positions include: Director Level positions, Kitchen Supervisor, Facilities Intern, Program Intern, Counselor positions, Lifeguards and kitchen assistants. Volunteer Staff: Click here to apply! Volunteer roles include: Christian Formation Team, CIT Program Team, Kitchen Help, Chaplain to the Staff, Arts and Crafts Coordinator, Activities Volunteer, Health Officer, Facilities Work Crew and anything else. Compensation for mileage and materials is available upon request.